Most of my Wednesdays are always the same. I wake up early and get ready for work. I work all morning and through lunch. I then usually spend my afternoon preparing for my classes on the following day. However, yesterday was special. Instead of spending my afternoon planning lessons. 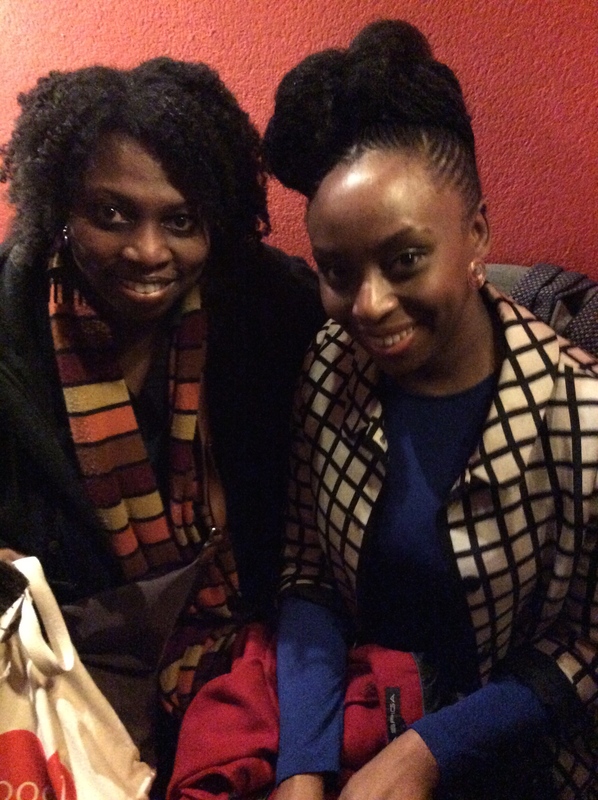 I went with a friend to Paris to La Maison de la Poésie to attend a talk with Chimamanda Ngozi Adichie. This was my first visit to La Maison de la Poésie and I’m sure it won’t be my last. It’s cozy and the main theatre is comfortable and the stage is visible to all attending, not to mention they invite interesting authors regularly. Tickets were sold on the internet, only 6€ to attend. We arrived just before 6pm and fortunately the doors were already opened. I don’t think we could have stood outside in the -1°C cold. As time moved on more and more people started to show. I met a blogger friend Marina from Young Gifted and Black, for the first time, as well as some other interesting bloggers. It was thanks to her that I learned about the event. Even though it was our first time meeting, we sat and had some passionate discussions about books and movies, while waiting to enter the theatre. It was as if we’d been friends for years. I hope to see he soon at some future events. Seven pm struck, the doors to the theatre opened and the crowd started to get excited moving quickly through to try to get the best seats. It was a full house. My friend Amy and I were seated in the middle, towards the back with a great central view of the stage. We sat in the dimly lit theatre for about 15 minutes, anticipation building, the time for the audience to get seated. Finally, Chimamanda Ngozi Adichie stepped on stage, the room went dark and the stage lit up, and alongside her were here interpreter, the interviewer, and the second guest, Belgian French author, Marie Darrieussecq. Darrieussecq published Il Faut Beaucoup Aimer des Hommes in 2013 and won the Prix Médicis the same year. I’ll definitely be picking her book up at some point. Its storyline was very intriguing. The talk seemed to fly by. We sat through about one hour and a half of questions and answers between both brilliant authors. It was remarkable to see how the themes touched on were similar in both of their books. Adichie made some very bold, honest statements that received overall applause, like when she said racism is not just a problem in the United States but also in France. She also spoke about how readers seem to always expect female characters to be likable, pretty, and acceptable. She said that shouldn’t be and that it’s rarely required of male characters. She said what would be the point of women just trying to be likable all the time. I couldn’t agree more. She said she wrote Ifemelu to be a character that had plenty of faults but that she thought readers would find interesting. And interesting, she was. Adichie also talked about feminism and mentioned how she couldn’t understand why everybody couldn’t be a feminist, since feminism is basically fighting for equality among the sexes. Another high point of the evening was the interpreters capacity and rapidity in translating Adichie, as well as all the others on stage. She was surprisingly quick and accurate. The only disappointing thing about the evening was that Adichie didn’t read from Americanah. The interviewer read an excerpt in French. I felt that was really missing, for the interviewer wasn’t capable of putting the correct tone on the words. Even though on a much brighter note, I had the pleasure of speaking with Adichie and taking a picture with her after waiting for about a half an hour in a pseudo queue. I say pseudo because there was a long line from one side and then there was a half circle surrounding Adichie that never seemed to dissipate. Frankly, If I were her I would have felt a little claustrophobic. 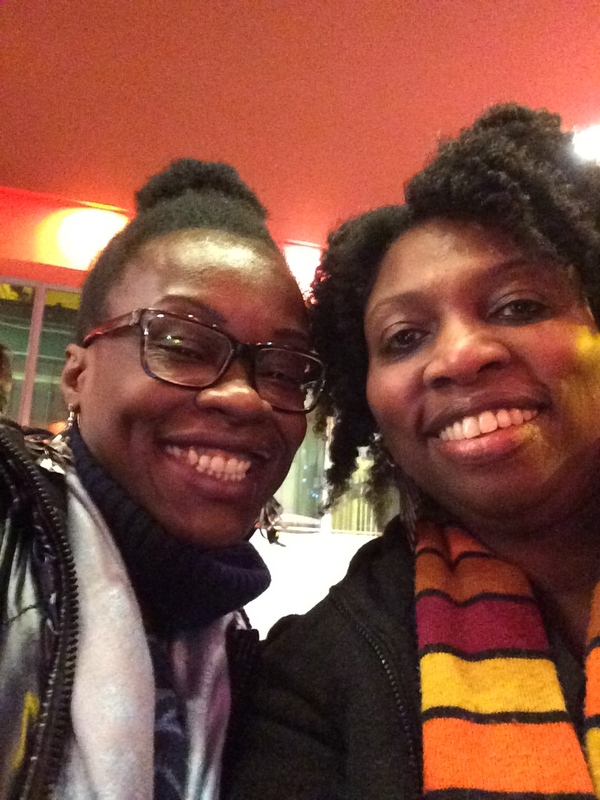 Author didibooksenglishPosted on January 22, 2015 Categories Bookish StuffTags autographs, book bloggers, Chimamanda Ngozi Adichie, Maison de la Poésie, meeting authors, signed copies28 Comments on A Special Wednesday….